Check out this great video of origami cat instructions! Remember to pause and play if it is going too fast so you don't miss any steps, and your result will be fantastic! Cats are a favourite household pet! They can be really funny, sometimes unintentionally!! 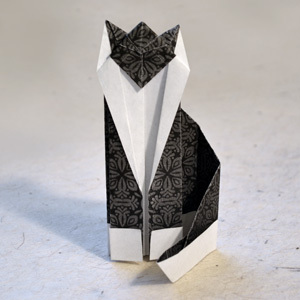 With this sweet origami design, you can make this gorgeous little kitty with just a few folds! This original origami design is created by Robyn Hondow. This origami cat can be a little challenging if you’re not experienced, but it’s not that difficult to learn either. With a few attempts, you will definitely get it right. This super cute cat can sit up, using its tail to rest on. Pretty cool hey? To make the best-looking cat, use a paper that is black on one side and white on the other to get the "tuxedo effect." A little background on origami art: Origami is a special way of folding paper which originated in Japan. It involves the creation of forms entirely by folding paper, and you can learn how to make this particular model in just one go. If you're looking for a new hobby, give this a try! Once you get started, you'll be hooked! The only material you need is a flat sheet of paper. You may use normal printer paper but of course, you will produce a better result if you use proper origami paper, which is a bit thinner and holds the creases better. Have You Made An Origami Cat?